I can’t believe that my little boy is starting school TODAY! I have no clue what I am doing, so wish us luck! I will be sure to share the pictures with you from his first day! Well, I will have to share the pictures with you in the next post because this post is actually scheduled and technically, I have no pictures yet. BUT, if you are reading this on Tuesday morning, you can check out my Instagram or Facebook and the pictures might just be there! Anywho…I am still doing very well with the “healthier me”, I didn’t even eat brownies that I made for the boys. Well, half a brownie, but it’s ok to reward yourself with a little something when you are doing well. I wanted to share one of my latest recipes with you, it….was…awesome! 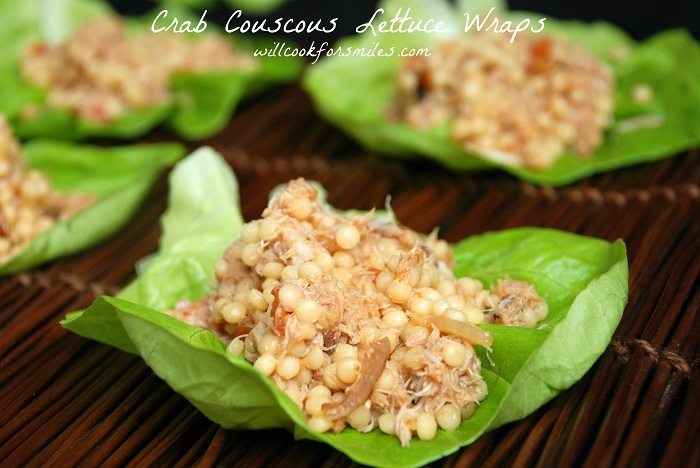 These Crab Couscous Lettuce Wraps are so good and guilt free! 1. Preheat the oil in a stainless steel pot (better for caramelizing). Caramelize the onions until nicely golden. Add tomatoes and grated garlic. Saute for a couple of minutes. 2. 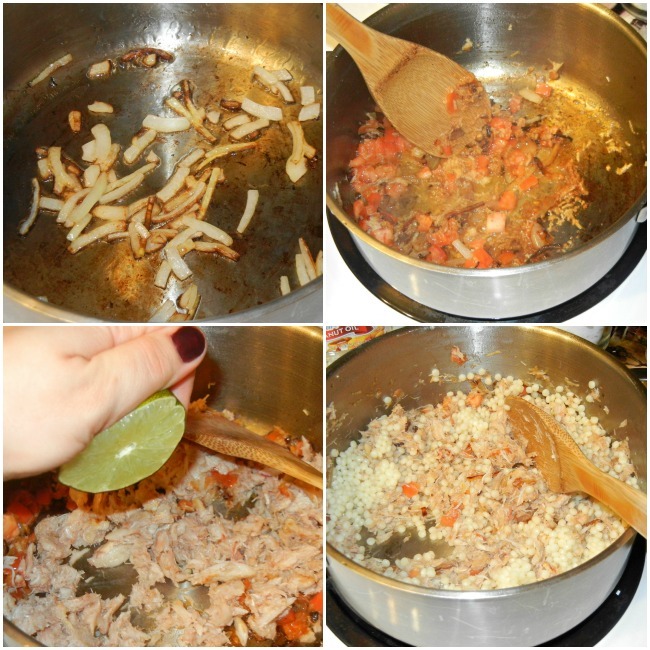 Add the crab meat and lime juice. Saute for a couple more minutes. 3. Add the soy sauce, mix well. Add the couscous and saute, stirring, for a couple of minutes. 4. Cool a little bit before portioning in the lettuce leaves and serving. It’s a beautiful idea and very(!) well done. We don’t eat crab (not allowed) but I’m thinking of using this idea with another filling. 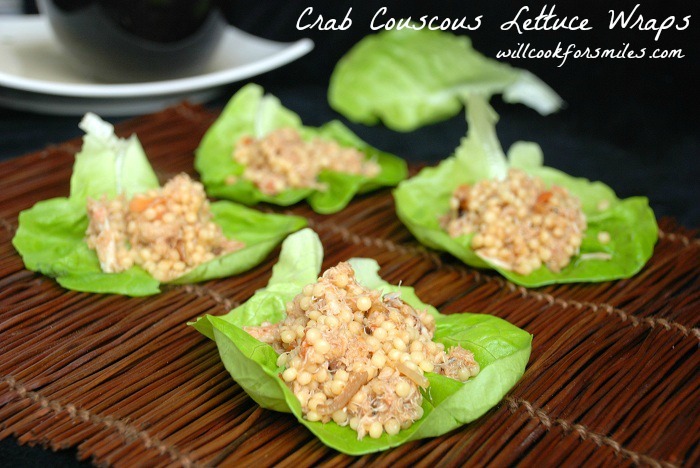 I make a similar dish with chicken and never would have thought to use crab. What a fantastic idea. Thanks for joining in at Teach Me Tuesday! So pretty, can’t wait to try making these! Found you at Miz Helen’s Country Cottage. 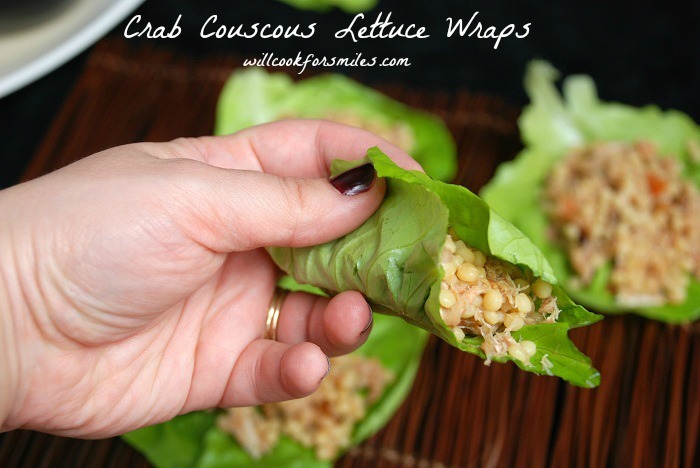 Love lettuce wraps and these look delicious! 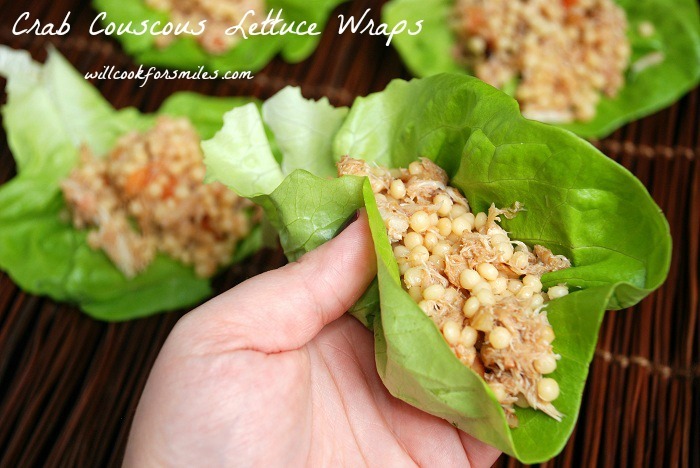 These Lettuce will be a great hit for the Big Game Day coming up. Hope you have a great weekend and thanks for sharing your tasty recipe with Full Plate Thursday. Love food I can eat with my hands! I really love the pearl couscous! Thanks for sharing at One Creative Weekend!